Doctor Who Big Finish- The Wormery | The Daily P.O.P. Despondent and depressed, the Doctor finds himself in Bianca’s, a special kind of bar where the owner slinks her way among the clientele between torch songs. She takes a special liking to the gloomy Doctor who is still recovering from the shame and humiliation of his trial with the High Council of Time Lords. He rebuffs Bianca’s attentions only to find himself buttonholed by a gin-soaked former acquaintance, the time-travelling vagabond Iris Wildthyme. For the uninitiated, the scatter-brained Iris Wildthyme is a character who popped up back in 1998 alongside the Fourth Doctor and already claimed to be an intimate acquaintance. Her back-story is purposefully garbled and is a reflection of the Doctor’s adventures mis-remembered or mixed up with other creatures or situations. She travels in a double decker London bus version of the TARDIS which seems smaller on the inside than out, sometimes with a panda companion. Played by former companion and consummate vocal performer Katy Manning, Iris is a beloved creation who has appeared with numerous incarnations of the Doctor. When Iris bumps into the Doctor, she finds him very cuddly beneath his prickly personality (which co-star Nicola Bryant has attested to) and attempts to lighten his mood. She accompanies the Doctor in a cab only to realize after leaving the club that it is actually a TARDIS floating in the aether of time and space. Iris seems more off kilter than usual as she has been imbibing liquor all night to get in touch with sentient worms that are swimming in the fluid. There is something very unusual going on in Bianca’s. Confronting the club owner, it soon becomes apparent that Bianca is another incarnation of Iris herself who has reached the end of her life cycle and wishes to steal her former lives… much like the Valeyard did to the Doctor in his aforementioned trial. Wormery is one of my favorite audio adventures as the performances are exemplary, the audio landscape of the club is expertly executed and the plot is bonkers. As co-stars, Baker and Manning are a sterling combination with Iris appearing to be suffering from an everlasting hangover yet really fancying the Doctor who just wants to be left to his ruminations. Paul Magrs is responsible for some of the most ambitiously outlandish stories in print and audio from the Eighth Doctor Adventures with Paul McGann’s Doctor to the Tom Baker audio series for the BBC. 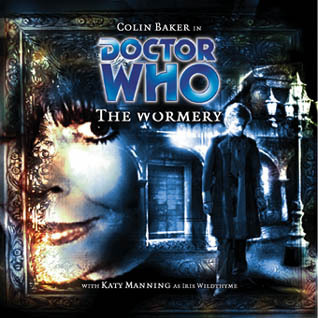 Not only is the Wormery an enjoyably whimsical tale but it is also full of depth and explores a moment of the Doctor’s life when his massive ego was chipped away in a humiliating attack from his own people. This Post was posted in Big Finish and tagged colin baker doctor who, doctor who big finish audio adventures, Iris Wildthyme. Bookmark the permalink.